Various extensions and functions. Some are written by me, some are collected online. And some are variations. This framework is supposed to give you a faster start with your project by combining some useful and often used code. Includes few UI classes extending UILabel as well since extensions for UILabel could not provide this functionality. This framework is base for some other frameworks I provide, whilst as alone, it doesn’t offer that much. LocaleKit framework was merged with CommonKit since release 1.2.3. LocaleKit allows App wide fixed locale to be defined and also provides some extended functionality to Locale as well while providing some simple data formatting options. My NumPad framework was merged with CommonKit since release 1.2.4. 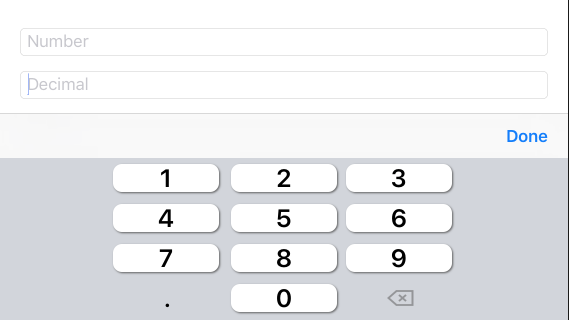 NumPad is a numeric keyboard (with some styling options, for example, phone style) which works on both, iPhone and iPad. Also provided is a DoneBar, ready accessory view with Done button for keyboards without Enter button. MathKit framework was merged with CommonKit since release 1.2.6. DateKit framework was merged with CommonKit since release 1.2.7. DateKit contains various Date extensions and general helpers for handling date and time in UTC format. DispatchKit framework was merged with CommonKit since release 1.2.7. DispatchKit contains extensions to DispatchQueue and a simple backgrounding task management. CurrencyKit framework was merged with CommonKit since release 1.2.9. CurrencyKit is a money presentation framework for Swift. FontKit framework was merged with CommonKit since release 1.3.0. 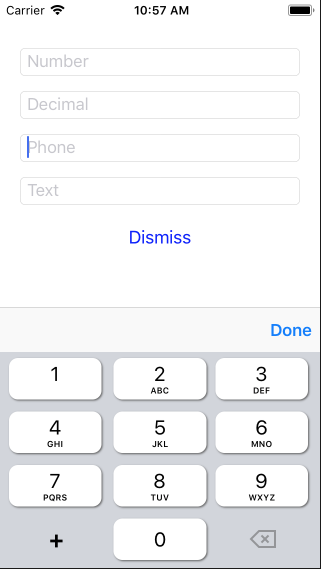 NumPad class provides a NumPad style keyboard for iOS platforms with some styling properties. Donebar is a fast UIToolbar initializer with Done button aligned to right. Used with UITextField or UITextView. On your own project ( in workspace ), add NumPad to it’s frameworks. add import NumPad to files where you need NumPad. Money calculations with currencies which have cents/pennies/etc with 2 digits. Presentation of Money value with locale. Contains a UI element based on textfield which allows entering a monetary value. Provides also a structure for item with price information. Array of items as cart. 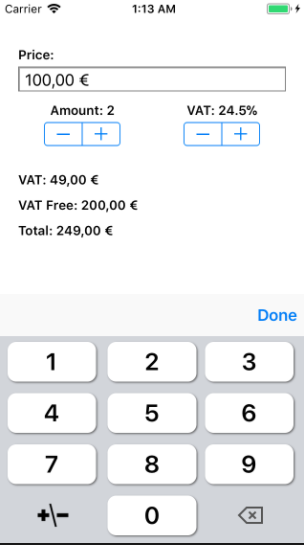 VAT calculation included for item prices. What keyboard is in the picture? It is CurrencyPad provided by this framework. Works on both, iPad and iPhone. Keyboard works a bit like a calculator, could I get cursor and make it work by standard keyboard or get it a bit less bulky? Sure you can, but then you will need to implement this by on your own. I am happy with it’s current implementation at the moment. What type of storage is used for storing money value? I used Decimal. And Money struct conforms to Codable. Can I sum different Money structs? Yes, in Cart/CartItem. Money is always money, so it doesn’t care about if one part of it is used for taxes or something. With VAT, you can get amount of VAT for sum, VAT0 sum, and sum with VAT multiplied by amount of items. And ofcourse, used VAT percentage of CartItem. What else is in CartItem besides price? I have done my best to provide precise values. VAT percentage has support for 1 decimal and Money has support for 2 decimals. Can I see some tests? Wow, first framework available which supports FontAwesome v5 in full! True… But it ain’t that much better from v4, which also had tons of icons, so if you have a project already using v4, updating to this maybe won’t make a significant change, icons still are what they are and sometimes more isn’t better. One can assume that you support all kinds of UI elements with this? There propably is a string parser which parses for FontAwesome style css references to icons and returns a AttributedString? Again, for solution, maybe you’d like to contribute in this as well by forking this? UITitleLabel.textOverflows = a boolean determining how to display label’s contents. If false, text should always indent so it starts from same position as first line, if text has wraps to multiple lines. If true, text overflows on the next line to start from elements leading coordinate instead. icon is type of compatibility class, which means there can be multiple ways to fill it in – provided ways are addressing directly to font -> icon, and string parsing to font -> icon. You can make more ways if this isn’t sufficient. How do I address fonts to icon? 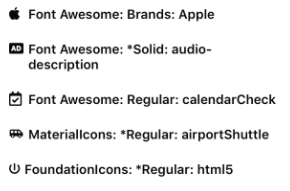 Apple suggests that I change my project’s Info.plist to list included fonts, should I now do that? It’s up to you, but if you use this with provided implementations (instead of addressing fonts directly with UIFont initializer) or atleast, first time access them like this, I have provided a automatic resource loader for fonts. If you want to use them directly, initialize them first with underscore as variable name, after this, they are usable directly from UIFont initializer – or you can make appropriate changes to your Info.plist, once again, it’s up to you. Code generator did output code that doesn’t compile! Yes – it’s not perfect. It’s just something to get you started – some icon names might need tweaking due to Swift syntax not allowing ones that came from generator. Enumerations provided by me already contain necessary changes. Included since 1.3.2. 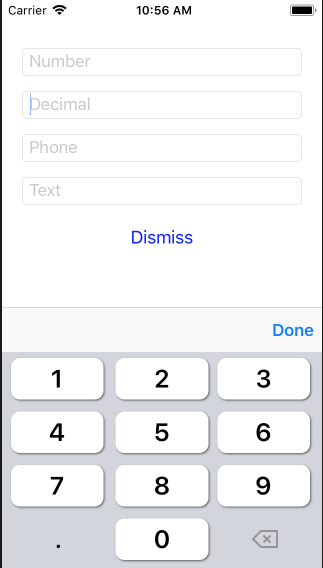 TableViewKit contains some improvements to UITableViewController, UITableViewCell and UITableView’s headers. Also brings few new classes: UITableViewControllerExtended and UITableViewCellExtended which have extended supported functionality. Also UITitleLabel is nice addition, it’s a base for custom cells which have icon and title. PhotoPicker and PhotoPreview are classes which allow you to present a photo picker with possibility of selecting multiple assets at once, PhotoPrevies is a photo displayer class. These both utilize provided AlertController. Camera support (if device has a camera, simulator doesn’t) is also supported in PhotoPicker. Recording or picking a video is not supported by this system, only stills. Camera interface includes common controls. ConditionalInit protocol is very handy when you need a lazy class (yes, class, because this one requires something that has init), but cannot use lazy because you want to in control and need to reset it once in a while. There are other ways to do this as well, like initializer function which is executed lazily, but here’s another approach. It is extended only to optional NSObject classes, so you cannot use it to non-optional classes. Saves some writing if you use a lot of these..
Yes- much more. This is actually quite a big pod with lots of stuff. Examples come with Podfiles, so go to examples root directory and execute pod install to enable compilation. Some parts of code can be considered more or less public domain, since ideas or even full implementations might have been derived from forums like StackOverFlow. CommonKit is now available through CocoaPods.